Steven Drozd is the Flaming Lips' guitarist. Do you really need to go to school to learn about rocking out? Many musicians might say no: Lock yourself in your room with a bunch of records and a guitar, put in your days on the road playing in scummy clubs, and you'll master the craft eventually. Or, starting this Monday, you could go to the real-life "school of rock" — the brand-new Academy of Contemporary Music at the University of Central Oklahoma. The program has true rock cred — it was started by Steven Drozd and Scott Booker, respectively the guitarist and manager of the Flaming Lips, a Grammy-winning rock band. "The idea here is not that we're just a school of rock," Booker says. "The idea behind this program is really as much about business and learning how the industry works while you're learning to play better." Unlike the original Academy of Contemporary Music in Guildford, England, the University of Central Oklahoma ACM offers an actual college degree. Booker adds, "not only are you taking general ed, but you're also taking aural skills and music theory and those things that anyone who's getting a music degree has to take." Aspiring rockers can send in demo tapes of themselves playing and singing, or examples of music they've produced. "It could be on GarageBand or whatever," Booker says. "We just want to make sure you understand some fundamentals, so everyone's at a certain level right at the beginning." "I wish this would have been around when I was a 17- or 18-year-old kid," says Drozd. "I'd been playing in bands for a long time already, and I thought about going to school, because I got a couple of scholarships, but then the idea of just straight college didn't appeal to me." "I've had several kids get their GED so they could quit high school early and come here," Booker adds. "And their parents came to me and were like, 'I was afraid that maybe he would have just dropped out of school.'" So what's on the curriculum at ACM? Booker says the school's semester will focus mostly on rock, because that's what the students are interested in. "So this first semester they'll be learning songs by The Who and the Eagles and the Flaming Lips and The Strokes, and Spoon. We got the Eagles, so we got a bit of country rock in there." Drozd also has ideas about what songs young musicians should study. "'Stairway to Heaven'," he says. "It's such an obvious choice, but that requires some actual real skill and it's got all kinds of styles in it. By the end, you're doing crazy riff rock and you've got that guitar solo, which I think is one of the best guitar solos of all time." But don't come into ACM intending to walk out with a million-dollar record deal. They're not promising you'll become a rock star. "Just like anything, there's a great deal of luck involved," Booker says. You know, if only I had gone to rock school, maybe my drumming would sound a little more like this. GREENE: Yeah, I'm probably not going to win a Grammy any time soon, like The Flaming Lips, but the members of that band are hoping they can teach some aspiring musicians how to become full-fledged rock stars like they are. Mr. WAYNE COYNE (Singer, The Flaming Lips): (Singing) Her name is Yoshimi, she's a black belt in karate. GREENE: The band's manager has launched a new school of rock, and this is not a Jack Black joke. Students who start classes on Monday will be on their way to earning an actual college degree. And here to talk to us about this Academy of Contemporary Music are Steven Drozd and Scot Booker. Drozd plays guitar for the band The Flaming Lips, who we were hearing right there, and Booker manages the band, and they're joining us from Oklahoma City, where I understand the school's based. Welcome to both of you. Mr. SCOT BOOKER (Manager, The Flaming Lips): Hello. 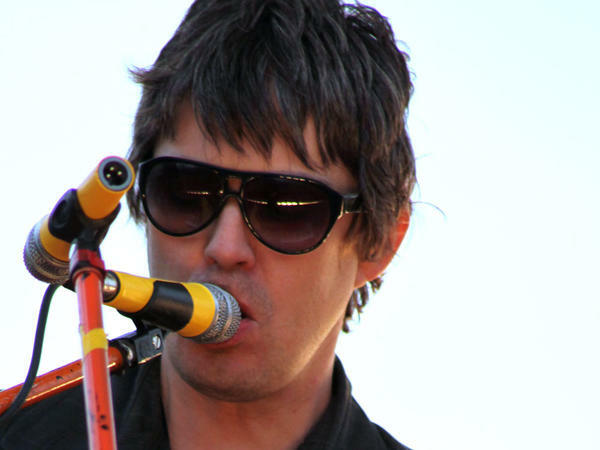 Mr. STEVEN DROZD (Guitarist, The Flaming Lips) Hello. Thanks for having us. GREENE: Thank you. So what did you guys think of my drumming? Mr. BOOKER: I thought that it sounded pretty good. Mr. DROZD: Well, he would, but I would say you need to come to my school. Mr. DROZD: Or learn how to program a drum machine, one of the two. GREENE: Well, Steven, you're going to be teaching a master class at this new academy. Will you give me some tips, some basics? GREENE: Here I go, okay. Mr. DROZD: Wait, let me see if I can count you in. That's a start right there. GREENE: Oh, count me in, yeah. Try counting me in. Show me how to do that. Mr. DROZD: And if you can't, then we'll know strike one right there. Mr. DROZD: One, two, three, four. Mr. DROZD: Um, showing promise with the funk, but a little herky jerky, so like a B, C. I would go with C.
Mr. DROZD: You keep working on that. Yeah. GREENE: I'll try. Scot Booker, could I have gotten into this academy? I mean, what does it actually take? What are the admission standards? Mr. BOOKER: Well, it depends. There's two paths and there will eventually be three. The first path is performance, and there's guitar, bass, drums and vocals. GREENE: Terrifying. Make sure it's actually them. Mr. BOOKER: Exactly. Well, we'll find out on Monday, I'm sure, you know. And on the production path, you send in something you've recorded, and that could have been on GarageBand or whatever. We just want to make sure you understand some fundamentals, so everyone's at a certain level right at the beginning. GREENE: So you're looking for some sort of level playing field, but I mean different background, different interests, or is there a certain sort of mould you want in that classroom? Mr. BOOKER: You know, the idea behind this program is really as much about business and the idea of learning how the industry works while you're learning to play better. We are leaning very much towards rock because the majority of the kids that are coming this first semester are into rock. So this first semester they'll be learning songs by The Who and The Flaming Lips and The Strokes and Spoon; we got the Eagles, so we have a little bit of country rock in there. THE EAGLES: (Singing) Take It easy, take it easy, Don't let the sound of your own wheels drive you crazy. Mr. BOOKER: And there's theory, I mean this is a degreed program, so not only are you taking general ed, but you're also taking oral skills and music theory and those things that anyone that's getting a music degree has to take. Mr. BOOKER: Absolutely, yeah, we're part of the University of Central Oklahoma, and I felt like this was important. GREENE: Steven, you're sort of living the dream, you know, of many wannabe rockers. But it was a sort of a fantasy coming true. Did you have any real classroom training, and why - if not, why would you say it's necessary? Mr. DROZD: Well, I think my big advantage was having a little bit of education, enough to, you know, I learned some piano and I based everything on that. I thought about going to school because I got a couple of scholarship offers through band and stuff, but then the idea of just straight college didn't appeal to me. Mr. BOOKER: I've had several kids get their GEDs so they could quit high school early to come here, and their parents came to me and they're like, I was afraid that maybe he would have just dropped out of school. GREENE: Have you had some skepticism? I mean are there parents out there who are saying, I'm not sending my kids to college to rock out? Mr. BOOKER: Well, I think more the grandparents than the parents, to be honest. Mr. BOOKER: But we've also been very clear that you're not coming here and we're promising you to become a rock star, because just like anything, there's a great deal of luck involved. Mr. DROZD: Well, "Stairway to Heaven." You can start with "Stairway to Heaven" right there, so - I mean such an obvious choice, but that requires some actual real skill and it's got all kinds of different styles in it. Mr. DROZD: There's the, you know, the acoustic intro and then you - as you go through the song, it sort of slowly builds and you've got - there's different sorts of chords that are just quintessential classic rock chording, you know, which would be very helpful to learn. By the end you're doing the heavy sort of riff rock, and you've got that crazy guitar solo, which I think still is one of the best guitar solos of all time. GREENE: Before I let you go, I'm sitting, I'm sitting, as I said, at a drum set and, you know, dreaming myself about one day being a rock star. But I'll put you on the spot. Is there a Flaming Lips song that sort of is on your mind as it should be part of your school? Mr. DROZD: Before I say anything, I'll bet Scot already has an agenda with that. What is it Scot? Mr. BOOKER: Well, my agenda is that since "Do You Realize" is the state rock song, it is definitely on the curriculum. Mr. DROZD: Are you messing with me? GREENE: I was just playing some more, you know. Steven Drozd is the guitarist for The Flaming Lips and he will be teaching a master class at the new Academy of Contemporary Music. And Scot Booker is the band's manager and also CEO of the school. Thank you guys both for joining us. Mr. BOOKER: Thanks for having us. Mr. DROZD: Thank you. Yeah. GREENE: This is WEEKEND EDITION from NPR News. I'm David Greene. Scott Simon is back behind the drum set next week. Transcript provided by NPR, Copyright NPR.